Mesh panels for ventilation & visibility, storage pockets, inside leash clips, privacy curtains, comfort floor pads, adjustable/removable shoulder straps, multiple entry panels, dual zippers, water resistant, holds color and cleans easily with soap and water! Black small carrier accepted by most airlines as carry-on luggage. 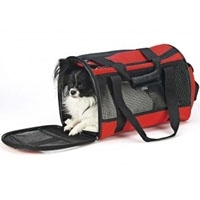 Mesh panels for ventilation & visibility, storage pockets, inside leash clips, privacy curtains, comfort floor pads, adjustable/removable shoulder straps, multiple entry panels, and dual zippers. The stylish, lightweight Spot Ethical Travel Gear Carrier that provides all the essentials you need for comfortable, safe everyday travel with your pet. 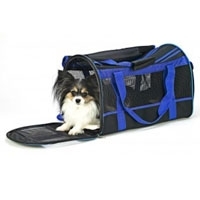 Side and top entry with heavy-duty zipper closure provides easy, comfortable access.